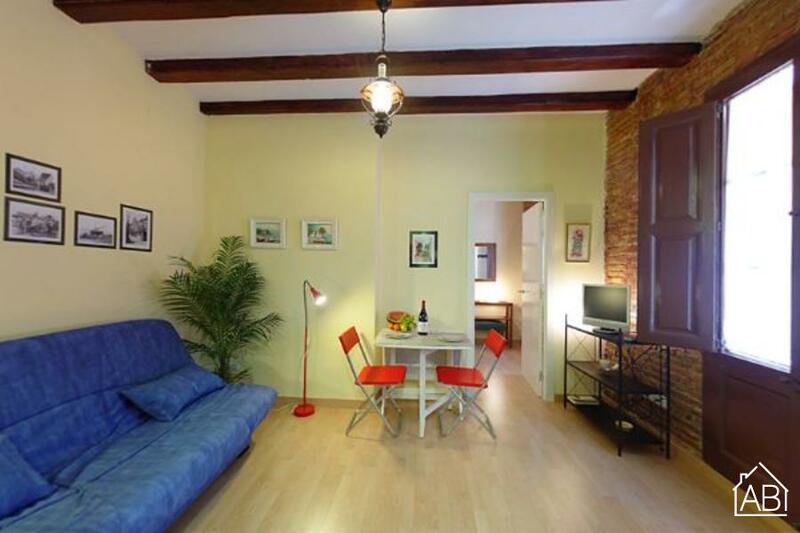 This simple, stylish one-bedroom apartment in Barcelona can accommodate up to four people. Situated in Barceloneta, you will be able to enjoy the beauty of the many beaches that are lined with an endless amount of bars, cafés and restaurants. The city center is a mere ten minutes away on foot. The design of the apartment displays a mixture of modern and traditional styles seen in the exposed ceiling beams, open-faced brick walls and parquet flooring. The living room is furnished with a comfortable sofa, TV and dining table, where you can relax after a long day. An Internet connection is also available in this apartment. The kitchen is compact but well equipped with plenty of the necessary utensils and appliances to create your favourite mealsl. The main bedroom has two single beds (which can easily be made into a double) while a double sofa bed can also be found in the living room. The bathroom has a walk-in shower. This apartment comes complete with heaters, air-conditioning and access to a balcony.